One of the things I miss about living in a city with a subway system is the myriad thoughtful design elements that go into managing a perpetual flow of tourists and commuters. New York’s subway map presents us with an iconic tangle of interlocking tributaries resembling diagrams of a circulatory system. The NYC system’s ingeniously simple graphic presentation of lettered and numbered trains, encircled in their corresponding colors, can be read by most anyone with a rudimentary grasp on the English alphabet---from a new language learner to a small child. The Washington, DC subway system, though a much more prosaic affair overall, whisks riders through impressively cavernous, catacomb-like stations, with brutalist tile and concrete honeycombs that seem to go on forever. The squiggly lines of its color-coded map likewise promise ease of use and legibility. And then there are the hours of reading time granted by a subway commute, a leisure I’ve relinquished now that I rely on car and bike. 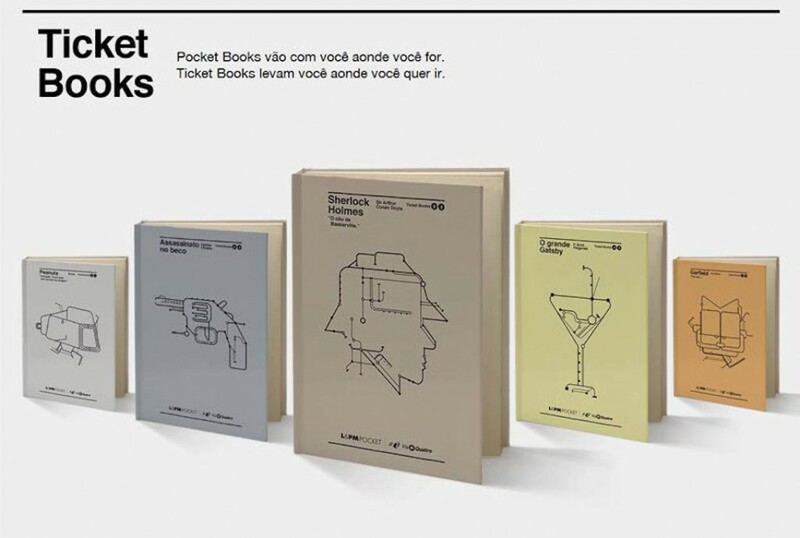 So you can imagine my envious delight in learning about Brazil’s Ticket Books, which are exactly what they sound like---books that work as subway tickets, designed with the minimalist care that major transit systems do so well. And what's more, they’re free: “To celebrate World Book Day last April 23rd,” writes “future-forward online resource” PSFK, “[Brazillian publisher] L&PM gave away 10,000 books for free at subway stations across São Paulo. Each book came with ten free trips.” Riders could then recharge them and use the books again or pass them on to others to encourage more reading, an important public service given that Brazilians only read two books per year on average. 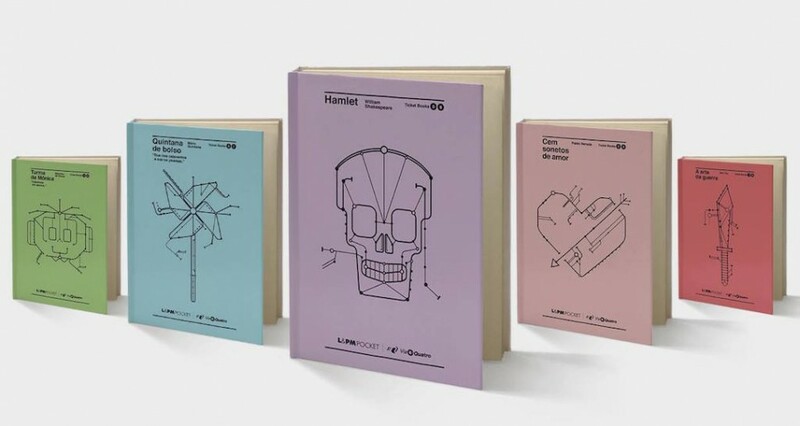 With subway map-inspired covers designed by firm Agência Africa, the books include The Great Gatsby, The Art of War, Hamlet, Murder Alley by Agatha Christie, Hundred Love Sonnets by Pablo Neruda, and more (including comic collections from Charles Schulz and Garfield’s Jim Davis). Watch an explainer video at the top of the post and see some lovely images of the book covers above. The campaign won three trophies at the Cannes Lions Festival in the categories “Promo,” “Outdoor,” and “Design,” and has proved so popular that publisher L&PM has expanded the project to other Brazilian cities, giving me yet more reason to visit Brazil. And if Ticket Books makes its way to a subway-enabled city near me, I may consider moving. Why Sao Paolo e not São Paulo or even San Paulo? No reason other than ignorance. I’ve amended to the correct Portuguese spelling. 2. work, get home, turn on the novela, then deadbrain news, more novela, sleep, repeat, remember to hide from colleagues if you read anything other than documents because it will become either a joke or reason for shaming! It’s very common to see this spelling of Sao Paolo amongst americans… it’s quite curious that they use the italian spelling of Paul, instead of the spanish spelling Pablo (which many americans think Brazilians speak) or even the english one. The portuguese spelling is the closest one to the english one… just add an O, while the italian has two different letters. Well, São Paulo got millions of italian immigrants back in the early 20th century, so maybe this spelling came from there and SOMEHOW persisted to this day in english, even though most americans are not aware of that italian immigration to São Paulo? Anyway, as anyone can guess, it means just St Paul. 1 – currently, R$15 is about $4 dollars. 2 – I guess the reason for the general poor numbers regarding reading in Brazil is just the wealth of the population in general. I do not doubt that, taking into account wealth of readers, Brazilians read about the same as american ones for example. It just happens you have MANY MANY MORE americans with money to buy books. Thinking of giving out books with bus passes to those newly released from prison. A collaborative effort between Words Beyond Bars and The Second Chance Center, both in Denver, CO. Thanks for the inspiration! @rogerpenna , not to turn this into a political discussion, but $4 when 70% of the population are paid about $500 monthly seems a bit expensive (almost 10% of their money) for a family who needs to employ that money on more.vital expenses. You meant 1%, but I got your point. Why be so selfish? Just give these poor hard working people some free books whose copyrights have run out. Pay for it with advertisements. How the heck do you think you get to Google for free? Or would you prefer that they stay illiterate so they don’t become a threat to you economically. The fact of the matter is that nations who read a lot are more peaceful because they can see through the nationalistic baloney-because they are happier, more informed, calmer, and more content. I’m talking about super-educated countries like the Netherlands, Germany, Scandinavia,and others. They just simply do not sit around pining over their countries being “less great”. Why? Because they’d rather read, create, help others, and have fun. Sure they watch the news but are just too intelligent to start getting angry at a picture on a screen. If you’re more concerned about making a buck than helping the poor people of this earth then in the end you’re going to lose out-plain and simple. Divided we fall; united we stand. That goes for the world as well as the USA. Take a look at Carnegie, Pratt, Jobs, Gates, and others. They literally invested in the advancement of the race.